Freddie Mercury – the frontman of legendary rock band Queen , Freddie was one of the most talented and innovative singers. His flamboyant stage performance and four-octave vocal range keep amusing us today. Also, he is a well-known cat lover by lavishing his cats with an abundance of love. Born in 1946, in Zanzibar, Tanzania, Freddie spent most of his childhood in India and began taking piano lessons at the age of seven. At the age of 17, Freddie and his family fled from Zanzibar for safety reasons due to the 1964 Zanzibar Revolution to England. Freddie began to study art and ultimately earned a diploma in Art and Graphic Design at Ealing Art College (now the Ealing campus of University of West London), later using these skills to design the Queen heraldic arms. In 1969, Freddie joined up with a group called Ibex as their lead singer. He played with a few other bands before joining forces with Taylor and May. They met up with bassist John Deacon in 1971, and the quartet—who Mercury dubbed Queen—played their first gig together that June. Queen’s music have been described as a fusion of hard rock and glam rock, it echoes through arenas with the thunderous double-stomp and clap of We Will Rock You to the triumphant We Are The Champions. Does it mean this, does it mean that, that’s all anybody wants to know. I’d say what any decent poet would say if anyone dared ask him to analyze his work: if you see it, darling, then it’s there! In 1975, Freddie wrote a seven-minute rock operetta for the album A Night at the Opera. Overdubbing his voice, Freddie showed off his impressive four-octave vocal range on this innovative track. The song hit the top of the charts in Britain and became a Top 10 hit in the United States. Freddie didn’t consider himself a particularly great pianist and he always dreaded performing Bohemian Rhapsody in concert because he worried he would mess up on the piano in the process. In addition to his talents as a singer and songwriter, Mercury was also a skilled showman. He knew how to entertain audiences and how to connect with them. The members of Queen collaborated with David Bowie, who is also known as a cat lover, to create Under Pressure . A No. 1 hit in Britain, the song’s distinctive bass line was later reportedly used by Vanilla Ice for his 1990 rap hit Ice, Ice Baby. 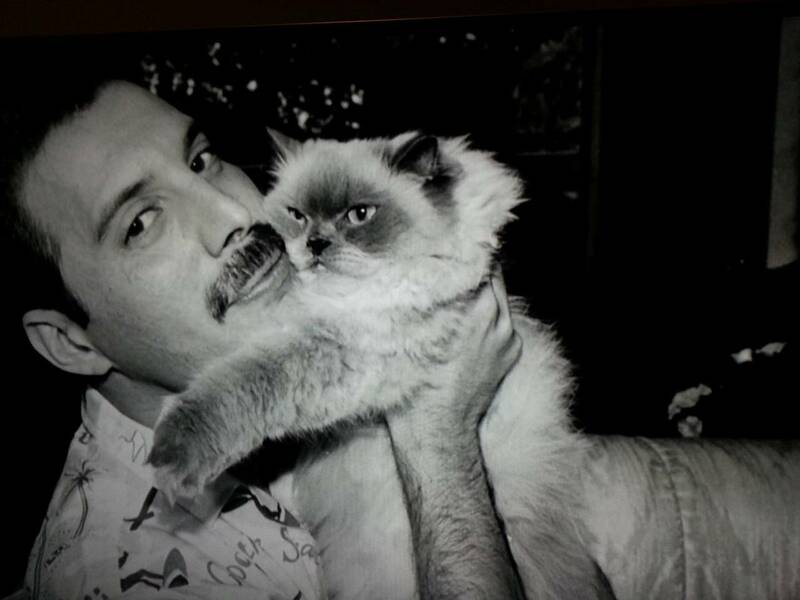 Freddie dedicated his solo album Mr. Bad Guy to his cat Jerry which was one of his first cats. All the songs he wrote himself, and it was a contrast to typical Queen work, as they were rock-orientated. Freddie was pretty much a multi-talented musician, he took part in everything from performing the tracks to sound engineering to obtain his desired effect. Freddie used synthesizers and orchestration in track development, adding to the diversity in each piece. Delilah may be the most famous feline of Mercury’s clan. 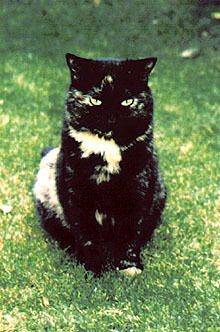 She was a large, tri-colored tabby who was adopted in late 1987. As the lyrics to her song state, she took over the house and pretty much did whatever she pleased. Delilah was always first on Freddie’s lap, first for food. In turn, Freddie favored her as well, picking her up more than the others. She would also run to him for safety when the other cats would gang up on her. She loved sleeping at the foot of his bed, or in the laundry baskets. A black cat that arrived the same day as Delilah was named Goliath. The tiny cat had a habit of disappearing, especially when company came. Once, when it was noticed that Goliath was gone for a long time, Freddie and his staff frantically searched the house only to find him sleeping in the marble sink in the bathroom. Miko, another tabby, came just after a trip to Japan thus the inspiration for her name. A white-faced tabby called Romeo was found by his boyfriend Jim Hutton and turned out to be quite a fighter. Freddie always wanted a white-cat. One of his cats, Oscar was an orange-and-white Tom who came to live with him via a boyfriend. Oscar was more of a loner, though, and went to visit other homes around the neighborhood when Garden Lodge, the two-story mansion surrounded by gardens and walls. While Freddie had homes across the world, all the cats lived in this Garden Lodge, and he spent most of his time there. Each cat got its own Christmas stocking filled with treats and toys. They had full run of the house and were permitted outside during the day to roam the gardens. Their unconditional love gave him great comfort and company in his final days, and Mercury would never deny them admittance to his bedroom. I have had cats for 55 years of my life I’ve had cats since I was 5 years old. They were always outside and they never lived long they were not mine actually in the beginning they were my mother’s. We did not spay or neuter so that is the reason they didn’t live long and cats now I believe are not for outdoors. I got my own cat from a pet store in 1985 who was a tuxedo and we called him Oreo he only lived 10 years. He developed an intestinal tumor that was gigantic so the prognosis was horrible. The first thing I ever learned to love was a cat. I had never been treated well in my family or by friends where I grew up in New York in the city. I cried more for the death of Oreo than anything in my life. It took months to get over him. They should have get given me a sedative. I’ve had three cats once and I have never suffered so much as from the loss of a cat. I have never loved anything as much as a cat. Amen to Freddie Mercury. Thanks for the comment, Wendy! I feel so sorry for Oreo and for you thinking about what he had to go through and you had to go through beside him. I was kind of a dog person until I picked up a stray cat sitting on a curb on her back, screaming like crazy. Think she was only a few weeks old, badly nourished, her mother cat or owner abandoned her alone. I brought her back home, I thought I had to do that otherwise she would die pretty soon. And she was with us only for two days. This little beautiful black cat opened the door for us to live with cats, these two days with her engraved in my mind. It’s interesting the feeling, the emotion evoked by them never get old and I feel it even grows after years. I am so glad you shared with your experience with your loved cats with us and for the wonderful impact they gave you in your life. I’m so glad that the little kitten you found was able to pass in your home, surrounded by love and warmth. Thank you for your care. Thank you so much for sharing your experience with Ella. Your story brought me tears as well. Sounds like she was an angel came to you to give you inspiration. It’s wonderful that you work in animal welfare and amazing she keeps you inspired all the way. Your plan to have a little black kitten tattoo reminds me that our black kitten sleeps under the plum tree in my parent’s home in Japan. We made the flower bed for her. When we encounter something truly beautiful, we want to engrave it in our hearts or physical bodies, I guess;-) That way we think we are together forever even after we are deceased. Oh, I want to see the pic when you have the black kitten tattoo!